Designed with a special blend of Nano-polymer molecules and NanoFusion technology. Our NANO-INFUSED WASH was built for and works perfectly with our S3FUSION Polish®. It produces just the right amount of suds which easily rinse off along with the dirt. Since it’s not the suds that cleans the vehicle, we designed a more environmentally friendly, easier to rinse off product which produces less suds and leaves fewer water spots than other products on the market. Mix our car wash using 1oz to 2oz per 1 gallon of water. Use a pail that has a grit guard placed on the bottom of it. You can make a grit guard yourself using plastic grating. Each time you dip in your cloth or sponge you want all of the dirt in the cloth to drop to the bottom of the pail below the grit guard. Keep your wash cloths free of dirt particles which can leave scratches on your finish. Our NANO-INFUSED WASH contains a special blend of Nano-Polymers which are deposited on your vehicle’s finish. Shine increases and friction is reduced! Begin by washing the top of your vehicle first. Wash a section and then rinse from the top down. Work so that you are rinsing down towards the bottom. Do not use household detergents unless you want to remove all of the wax or polish that is on your vehicle. 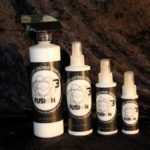 S3FUSION™Nano-Infused Wash is designed with a special blend of Nano-polymer molecules and our Patent Pending NanoFusion Technology. This wash was built for and works perfectly with our S3FUSION™Professional Polish. It produces just the right amount of suds which easily rinse off along with the dirt. We designed a more environmentally friendly, easier to use product which produces less suds and leaves fewer water spots. It’s not the suds that removes the dirt! It cleans, conditions, and protects your shine in one easy step, lifting and suspending dirt which can be easily rinsed away. Since there are no petroleum derivatives in it, it safely cleans and protects and will not streak. 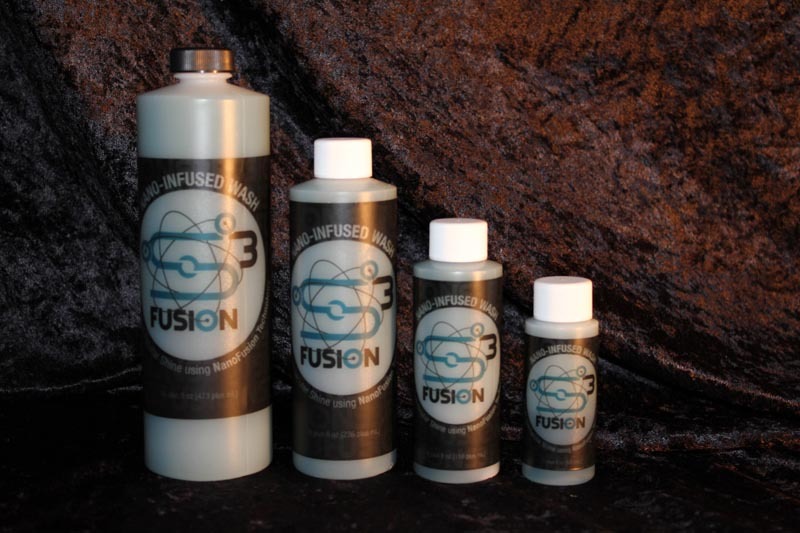 S3FUSION™Nano-Infused Wash will not remove the spectacular shine produced byS3FUSION™Professional Polish. 1.Thoroughly rinse your vehicle to wet and loosen dirt and grime. Start at the top and work downward. This will remove much of the surface dirt and rinse it off of the vehicle. 2. If using S3FUSION™Wheel, Tire, Bug, and Tar Cleaner liberally spray on each tire and wheel to loosen brake dust and clean tires. 3. Add 1 – 2 oz of S3FUSION™Nano-Infused Wash per gallon of water to a clean wash bucket. If possible have a grit guard on the bottom of the bucket. 4. Start washing your vehicle from the top first. Use clean microfiber cloths or a wash mitt. As you finish a section rinse well to remove suds and dirt. Always rinse your wash cloth in your wash bucket often to remove any dirt from the cloth. Wash each section thoroughly. As you move your hands over the surface you may feel bugs and tar stuck to the finish. Use S3FUSION™Wheel, Tire, Bug, and Tar Cleaner to safely and simply remove these. 5. Once the entire vehicle, the tires, and wheels, have been washed give it one final rinse. 6.Dry the vehicle with microfiber cloths to prevent water spotting, especially if the mineral content of your water is high. Caution: Keep out of reach of children. Can irritate the eyes. Copyright © 2019 All rights reserved | S3Fusion, LLC.